Celevac 500mg Tablets contain the active ingredient Methylcellulose which helps to restore normal bowel function in both constipation and diarrhoea. Celevac 500mg Tablets (methylcellulose) - The dual action of Celevac Tablets stops diarrhoea fast and relieves diarrhoeal pain. It can also treat and relieve the symptoms of constipation. How do Celevac tablets work? When you are constipated, the stools become abnormally dry and hard and are painful and difficult to expell. Methylcellulose absorbs water so it helps to soften the stool, and as it swells up in the intestines it increases the volume of the intestinal contents. This stimulates the muscular movement of the gut, which helps to move the stools through the intestines. 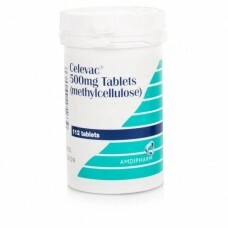 The full laxative effect of Celevac Tablets may take a few days to develop. Since methylcellulose absorbs water in the gut, it can also be used to treat simple diarrhoea. With its ability to treat constipation and diarrhoea, methylcellulose is also used to control the consistency of faeces in people with a colostomy or ileostomy. Methylcellulose is also used to reduce appetite in obese people who are trying to lose weight. It is taken half an hour before each meal and when hunger pangs are severe. As it swells in the gut it gives a feeling of fullness that helps reduce food intake. What is it used for? Bowel movement disturbances Constipation Controlling the consistency of faeces in people with a colostomy or ileostomy Diarrhoea Management of ulcerative colitis symptoms Reducing appetite in the treatment of obesity What is constipation? A condition in which bowel emptying occurs infrequently A condition in which the stools are hard and small A condition where bowel movement causes difficulty or pain How common is it? Constipation is thought to affect a quarter of the population at some time. Constipation is more common in the elderly because: the power of the bowel muscles diminishes with age they tend to take more medicines that have constipating side effects. What are the symptoms of constipation? Tummy pain associated with bowel movements. A feeling of incomplete emptying of the bowel. A bloated feeling in the stomach region. Diarrhoea: constipation is one of the most common causes of diarrhoea, especially in the elderly in care. Diarrhoea caused by constipation is known as bypass diarrhoea. What are the main causes constipation? Poor general health. Immobility or an inactive lifestyle. Insufficient fluid intake. A diet low in fibre. Fibre retains fluid and makes the stools light and soft. Irritable bowel syndrome (IBS). Inadequate toilet facilities. 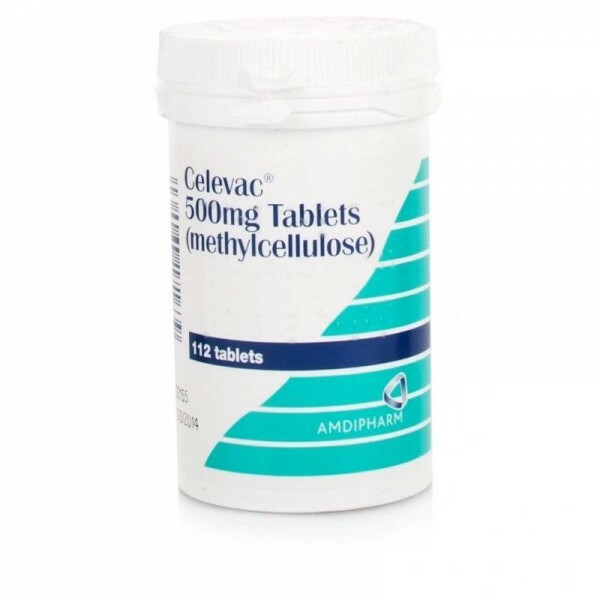 Celevac 500mg Tablets (Methylcellulose) - If you have been prescribed Celevac tablets, take them exactly as your doctor has told you to. If not, follow the recommendations given below. You should check with your doctor or pharmacist if you are unsure. These tablets should be broken in the mouth before swallowing with liquid. It is important that you drink the right amount of liquid for your condition. Celevac tablets swell in contact with water and should be swallowed carefully. Do not take these tablets before going to bed. The usual dose depends upon the condition you have, and you can increase or decrease the dose within the limits given below, until you are happy that your condition is under control. For simple constipation: take 3 to 6 tablets, two times a day with at least 300 ml (half a pint) of liquid. You may be able to reduce the dose as your bowels begin to work properly again. For the control of colostomy, ileostomy and simple diarrhoea: take 3 to 6 tablets, two times a day with as little liquid as possible. Do not drink for 30 minutes before and after taking the tablets. For the control of diverticular disease and ulcerative colitis: the usual dose is 3 to 6 tablets, twice a day, depending on the amount of constipation (drink 300 ml or half a pint of liquid), diarrhoea (with a little drink) or pain. For appetite control and the treatment of obesity: take 3 tablets with at least 300 ml (half a pint) of warm liquid 30 minutes before each meal and between meals when the feeling of hunger is severe. Celevac 500mg Tablets (methylcellulose) - Medicines and their possible side effects can affect individual people in different ways. No side effects have been reported with this medicine. For more information about any other possible risks associated with this medicine, please read the information provided with the medicine or consult your doctor or pharmacist.